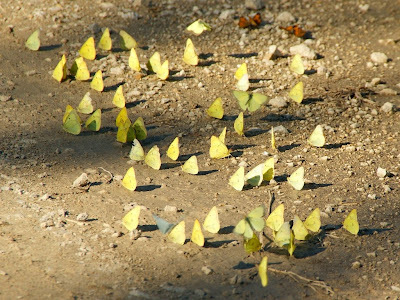 When I go down the road on a photo walk, there are always large groups of Clouded Sulphur butterflies at the end of the gravel road where it meets the blacktop road. It's always fun when I turn to walk down the gravel, because all the butterflies start flying and flittering around me. It's like being in a fairytale, where I'm at a magical place where the butterlies flutter around me. Yes, I know I'm weird. Fascinating! What a wonderful capture of lovely butterflies! I can see how you'd feel magical with them all fluttering around you! A wonderful Mellow Yellow Monday post! Oh! I'd love that experience! !